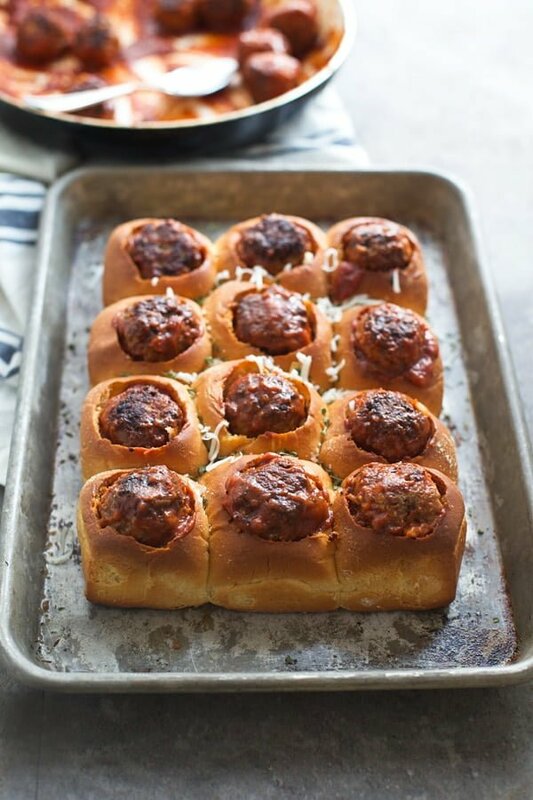 These Cheesy Garlic Bread and Meatball Rolls are the perfect Game Day finger food! 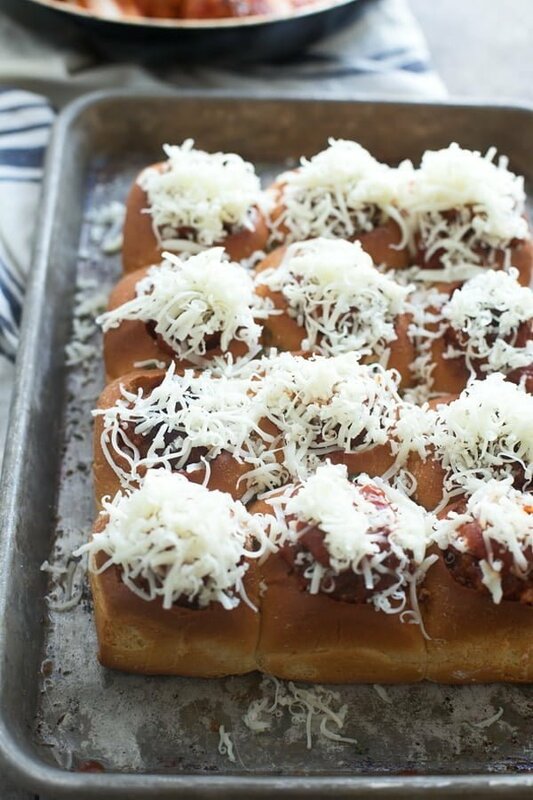 Hawaiian rolls are toasted in garlic butter, stuffed with cheese, tender meatballs, covered in more cheese and then baked until gooey and hot. Much like the rest of the world,I have a mild obsession with turning those delicious little King’s Hawaiian rolls into something cheesy, bite-sized and party-worthy. I’m pretty sure the trend started with these Ham and Cheese Sliders that took the internet by storm a few years ago, and now every blogger, party planner and cook seems to have their own version — myself included. I try not to fall in to trends too often, but this one, was something I couldn’t ignore. My inaugural recipe started with these Cheesy Mexican Breakfast Sliders, which are pretty much the most delicious thing on the planet next to these Chopped Cheeseburger Sliders that may be be even more addictive than greasy White Castle burgers. Suffice it say, neither one of them are particularly healthy, and today’s Cheesy Garlic Bread Meatball Rolls are no exception. I know we’re supposed to be focusing on healthy foods and all that, but I still believe in a little wiggle room when the week is over, so come Friday, all bets are off. Plus if you only have one, it doesn’t even count! Knowing there’s a potential for a slew of playoff games to be in my future, had my brain running like a hamster wheel just spitting out ideas for game day-worthy appetizers. As I was running through the archives of the site, making sure I didn’t repeat any prior recipes, I stumbled upon these Meatball Subs and realized I had every intention of turning the full-size portion into a miniature version, but forgot about it months ago because I didn’t want to bombard you with yet another way to consume meatballs. I happen to be a sucker for a big batch of spaghetti and meatballs, and almost an even bigger sucker for a meatball sandwich. There’s just something about the flavorful, spiced-studded meat paired with a robust sauce and a crusty roll that just makes me feel good, so it just made sense to turn the big kid version in to something a little bit more manageable for a party. Or tiny little toddler hands (omg I have a toddler!). I wanted these to be what I call the perfect bite, almost a meal in and of itself — so a little bit of garlic bread, a LOT of cheese, a little bit of sauce, and of course, the main guy — the meatball — were all a part of the plan. I could have just split the entire package of rolls down the middle lengthwise as most people do when it comes to these types of sandwiches, but I absolutely hate how everything spills out the sides when it comes to meatball sliders or really anything that’s not super compact. So, I thought I’d take a note from these Croque Madame Rolls, and hollow out the middle instead to make a perfect cozy vessel for each meatball. Before I nestled the meatballs in to the bread, I wanted to create a hard barrier so the sauce wouldn’t seep through and consequently make the bread soggy, so I brushed the insides with garlic butter, sprinkled the inside with a little bit of garlic salt and baked them until they were slightly crisp and just starting to turn golden brown. The meatballs and sauce are sort of emulated from these Classic Spaghetti and Meatballs, but I didn’t have a lot of the same ingredients, so I improvised and they actually turned out to be some of the most delicious and melt-in-your-mouth meatballs I’ve made yet. So soft. So flavorful. So easy to throw together. Usually I’ll use Italian sausage as the major flavor punch in my meatballs, but this time, I used 1/2 pound lean-ish ground beef, and then 1/2 pound of ground pork. I threw in an egg, some crushed up breadsticks (if you don’t have breadsticks, use crushed up saltine crackers, ritz crackers, really any kind of cracker will do, just make sure you don’t use pre-bought breadcrumbs. ), plenty of parmesan cheese, a good amount of fennel seed, some crushed red pepper flakes, Italian seasoning, a liberal amount of salt, just a touch of pepper, onion and garlic. The meatballs get fried up in a bit of olive oil, the sauce is quickly thrown together, and then everything simmers for a few minutes so the meatballs can finish cooking. Once the garlic bread rolls come out, sauce and cheese are spooned in the bottom, the meatballs go in, more cheese goes on top, and they are popped into the oven until the cheese is melted. I just slide them on to a serving platter, sprinkle them with a bit of chopped parsley and then they’re ready to go. For other cheesy snacks made with Hawaiian Rolls, check out these posts! Buttery rolls are hallowed out, made into garlic bread and then stuffed with meatballs, sauce and cheese. 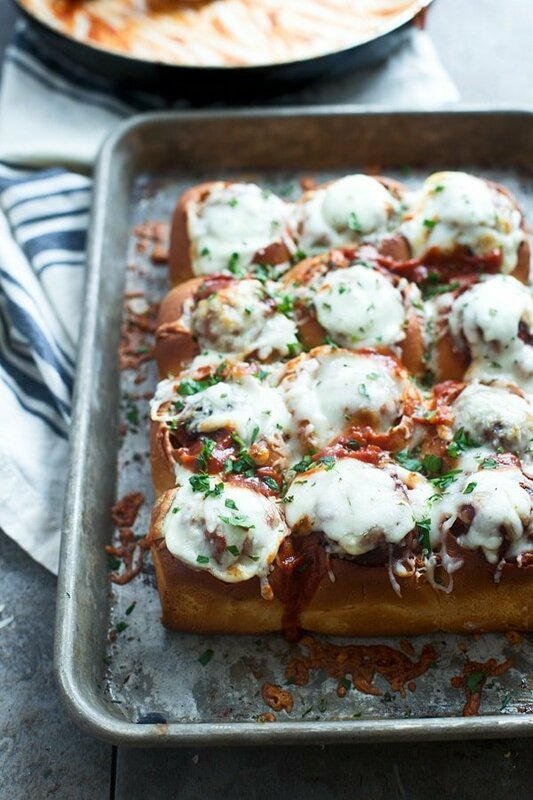 They're basically a compact meatball sub, and perfect for parties! Preheat oven to 350 degrees. Grease a medium baking sheet. Use a sharp knife to cut holes in the tops of each roll. (I traced around a tablespoon). Remove bread so you have a hole big enough to fit meatballs. Add butter and garlic to a a small saucepan. Turn the heat on medium-low and cook until the garlic is softened, about 1-2 minutes. 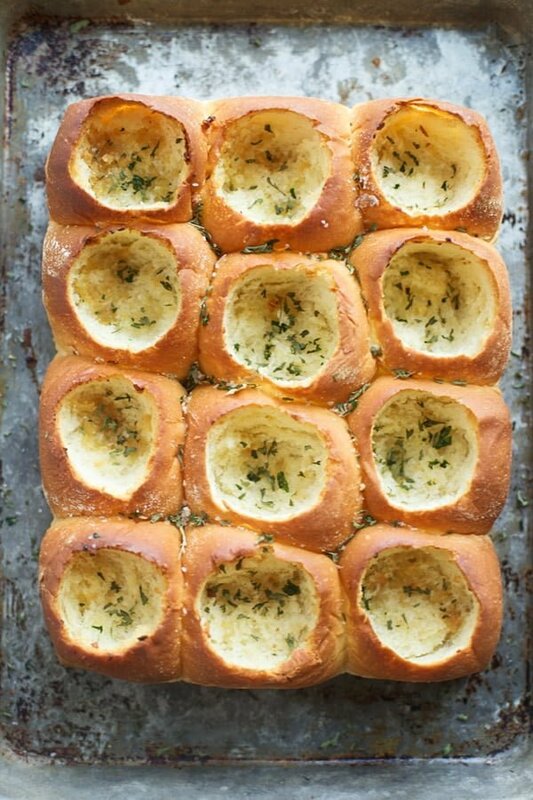 Use a pastry brush to brush the insides of the rolls with garlic butter. Sprinkle the inside of rolls evenly with garlic salt. Place on baking sheet and bake until slightly golden brown, about 10-12 minutes. While the rolls cook, make the meatballs. Add beef, pork, 1 garlic clove, minced, 1 tsp salt, egg, crushed crackers or breadsticks, onion, parmesan cheese, fennel, red pepper flakes, and 1 tsp. Italian seasoning to a bowl. Use your hands to combine the meat with the rest of the ingredients, do not over mix. Form into 24 meatballs. Add 2 tsp of olive oil to a large skillet. Brown half of the meatballs. Repeat with remaining meatballs. Remove meatballs from pan and pour in red wine. Use a wooden spoon to get any brown bits off the bottom. Bring to a boil and reduce to a simmer for 1-2 minutes. Add tomato paste, water, sugar, and remaining salt and Italian seasoning. Whisk to combine. Add meatballs in to sauce, cover and simmer until meatballs are cooked through, about 7 minutes. Once meatballs are cooked through and rolls are crisp, spoon a little bit of sauce in to each roll. Evenly divide ½ the cheese in the hold of each roll. Nestle meatballs in rolls. Cover with remaining cheese. Bake until cheese is melted, about 7-8 minutes. 40 Responses to "Cheesy Garlic Bread and Meatball Rolls"
Such a great idea!!! Will definitely be giving these a go tomorrow during game day! These are absolutely brilliant! Even my two picky eaters will be excited for these, putting them on the menu! When did you add the tomato paste? So sorry Marnya, the recipe got cut off. Updated! It’s right after the red wine! These are genius! I hate when everything spills out the sides too! This was very good, family really enjoyed it. So glad you liked it Tracy! Just made this….make sure to watch the bottom. Turned out great other than the bottom a little more done than I would like, but will definitely make again. can’t wait to try these! hubby will love it! Thanks for this recipe…I love it. The GM ad on this post, though….very frustrating!!! How could I substitute ground pork without taking any flavor away from the dish?? You can use all ground beef, no problem! Have you ever tried with precooked frozen meatballs? Just trying to save time and work in the kitchen. I haven’t, but I think pre-cooked would work just fine! I would just make sure to defrost them before so they get hot before the bread gets too crisp and the cheese gets too brown. I made with premade meatballs. I heated them in the sauce as the rolls were toasting! Worked great (saved a little time). Why couldn’t you crumble up the part you scoop out of the roll and use instead of crackers. Then there is no waste. Don’t know how it would work but it seems like it would be okay. Donna, you could absolutely re-use the bread! My “famous” meatballs use saltine crackers, so that’s what I personally like, but if you don’t want to waste, totally skip it! Or do half the crackers and the bread. Be sure to soak the bread in a little bit of milk before so it doesn’t make the meatballs dense. Good luck! Would love to make these for a church group. Will they get soggy if not served right away? You should be fine if you serve them within a couple of hours! Any semi-good quality merlot or Pinot noir will be great! 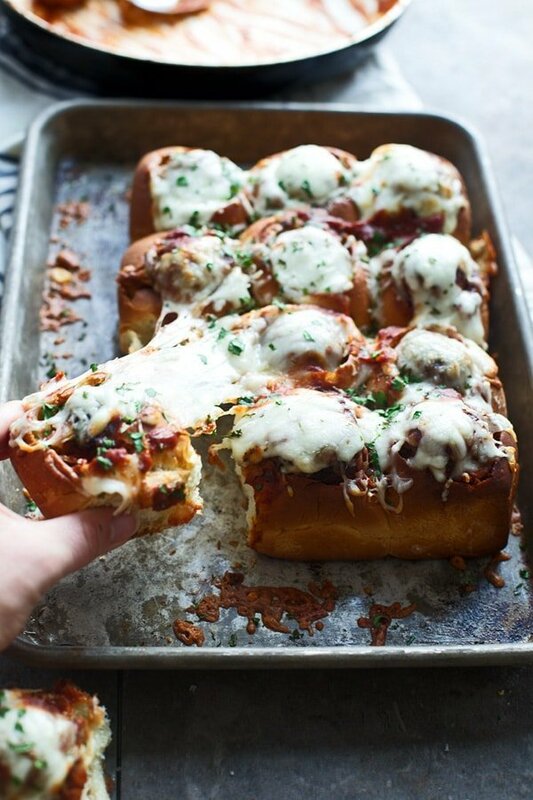 Love your cheesy garlic bread meatball rolls recipe. I’ll definitely try it, but instead of 1 egg i’ll use 2! Thx for sharing Nicole! found this site by accident. i can usually read a recipe and instantly know if i’ll like the outcome. i’m definitely going to try these meatballs soon. i’ll be back!! Can these be made ahead and frozen, which is one of the great thing about sliders? Delicious! I used frozen meatballs. I can only imagine how great they will be next time when I actually make the homemade meatballs. 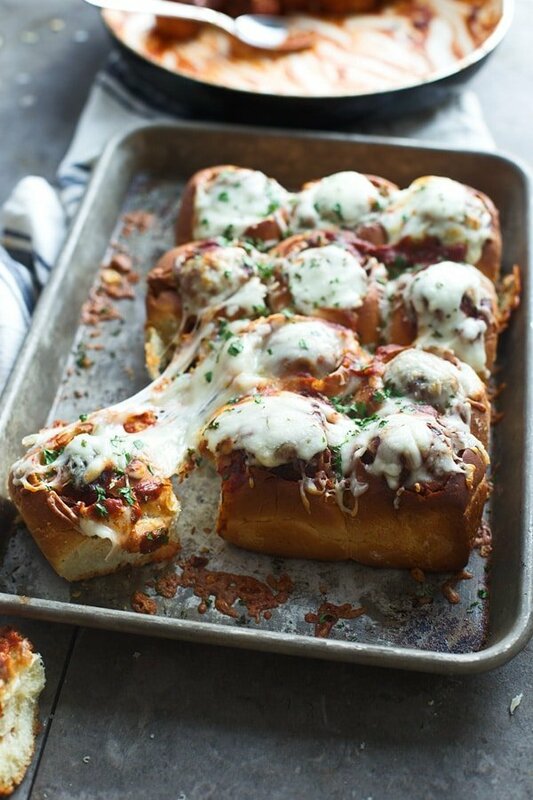 These cheesy garlic bread meatball rolls just look so incredibly delicious and I am so craving a slice right now! Can I post it on my blog?